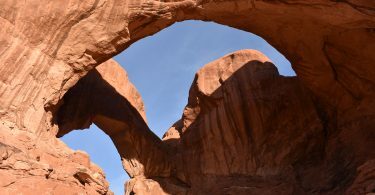 The short trail called Windows in Arches National Park leads to three large beautiful arches. 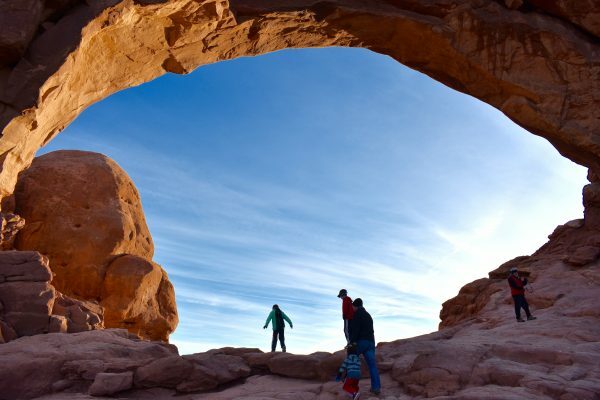 The trail is only about one mile long and allows you to stand right next to, or in some cases, in the arch itself. This trail starts at the end of the road in the Windows section of the park. There is a small parking lot at the trailhead and a little more parking farther down. 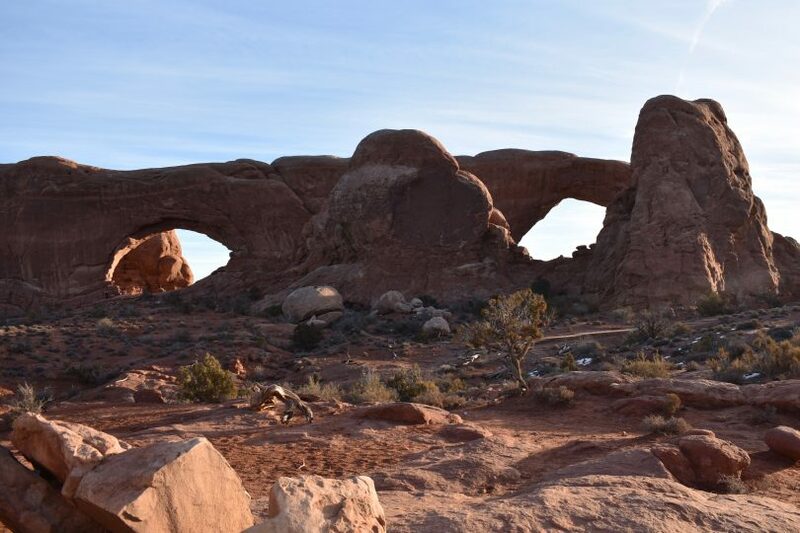 Two of the three arches can be seen in the distance along the skyline from various points along the main road. 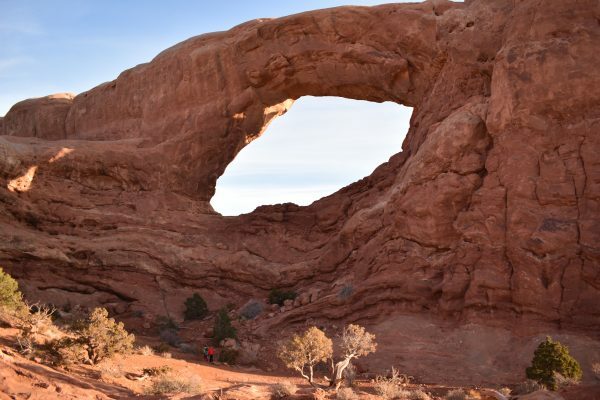 Double Arch is on the other side of the parking lot, so make sure to hike that one after you hike the Windows. The trail is well marked and starts out climbing very gently. 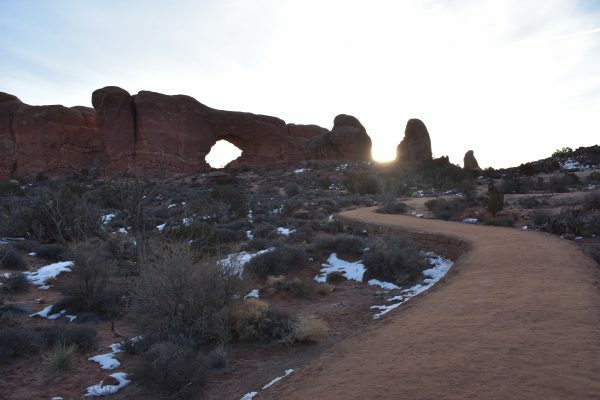 It is a loop trail, and we always take the far right fork, which leads to Turret Arch. This arch is quite tall and narrow. 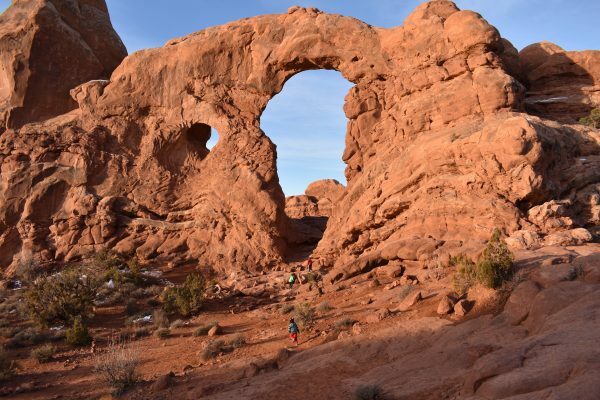 Turret Arch appears barely a quarter mile from the trailhead. 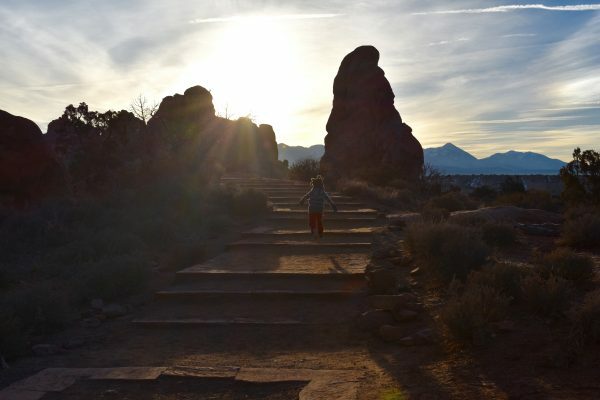 The trail to Turret Arch has a few stairs, but it is still simple. Turret arch is quite tall and impressive. The trail continues on around the back of the South Window. 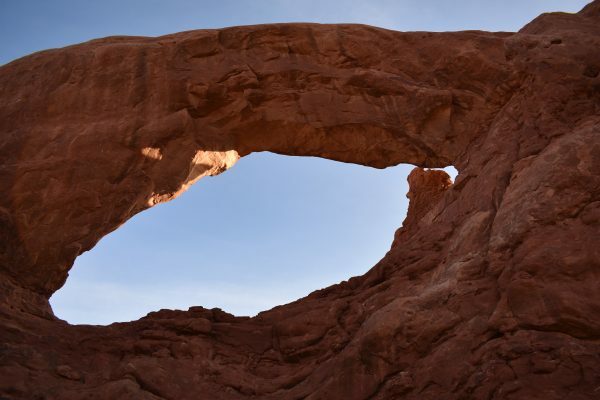 There is a primitive trail that continues down through the arch, or the main trail which continues to the North Window. 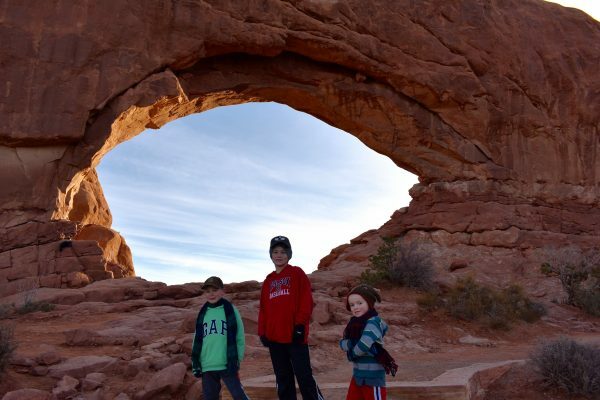 North Window is particularly beautiful, especially for a sunrise because you can stand right in the arch facing east. There is a slight drop off on that side, but it is not very dangerous. The trail then loops back to the parking lot. We were there in the morning and the sun was very bright. There is a trail to the bottom of the South Window. The arches look so beautiful against a blue sky. North Window can be seen from the parking lot. You can walk right under the North Window. 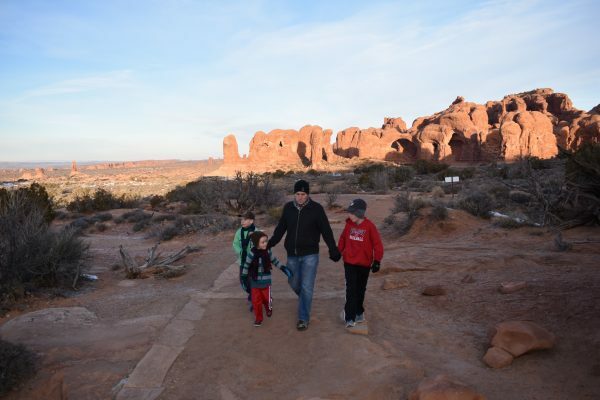 We recommend taking this trail on the way into the park as it is a great introduction to Arches. 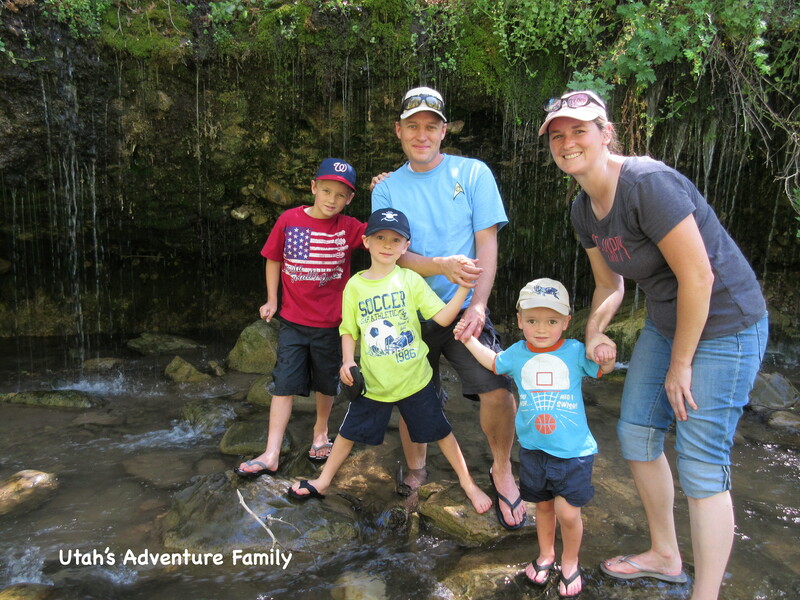 Our youngest hiked this entire trail by himself shortly after he turned one year old, so it is accessible to any age or skill level. 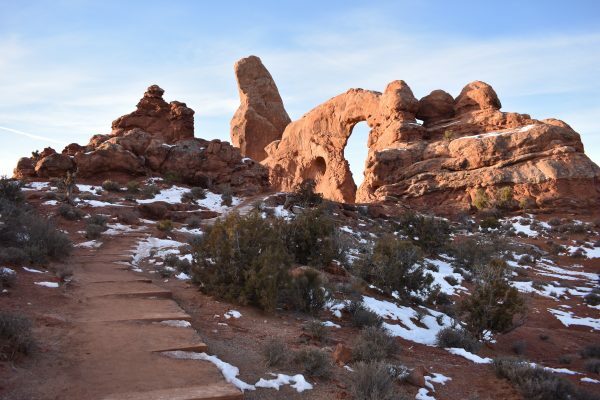 This trail also pairs very well with Double Arch, which is shorter and equally impressive. 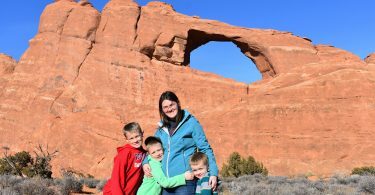 There are lots of great kid hikes in Arches, so visit our post with all of our favorite hikes in Arches National Park.